Steve McIntyre highlighted a response from the Institute of Physics (Publsihers of Environmental Research Letters) to a UK Times article reporting the suppression of a global warming paper submitted by Dr. Bengtsson. A paper which again attempted to document the less than supportive evidence observed temperatures provide for climate models. The paper was written by a well known climate scientist who chose the unfortunate path of publishing TRUTH rather than Real Climate dogma necessary for success in today’s Climate Science™ field. Summarising, the simplistic comparison of ranges from AR4, AR5, and Otto et al, combined with the statement they are inconsistent is less then helpful, actually it is harmful as it opens the door for oversimplified claims of “errors” and worse from the climate sceptics media side. I am literally gobsmacked by the comment. The reason Nicola Gully highlights for rejection is unique. Even though numerous papers showing the like have been suppressed, apparently everyone is already aware by now of the massive failures of climate models to represent observed temperatures, so observing said failure in a journal is NOT innovative enough. Since models have obviously failed, someone should phone Gavin Schmidt. If you live in a climate cave, here is an example of models vs temperature (failure) — exhibit # 1,134,207. 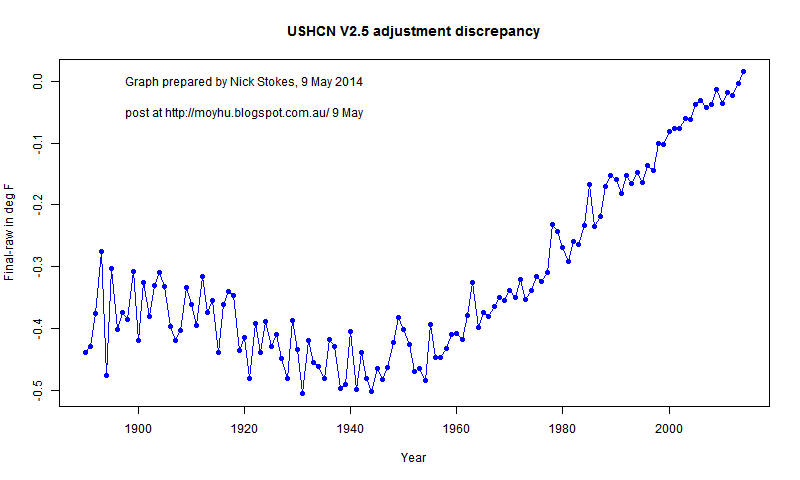 McIntyre et blog: observed temp trend is shown as the red line. So models and observations are not to be compared. Got that folks!! 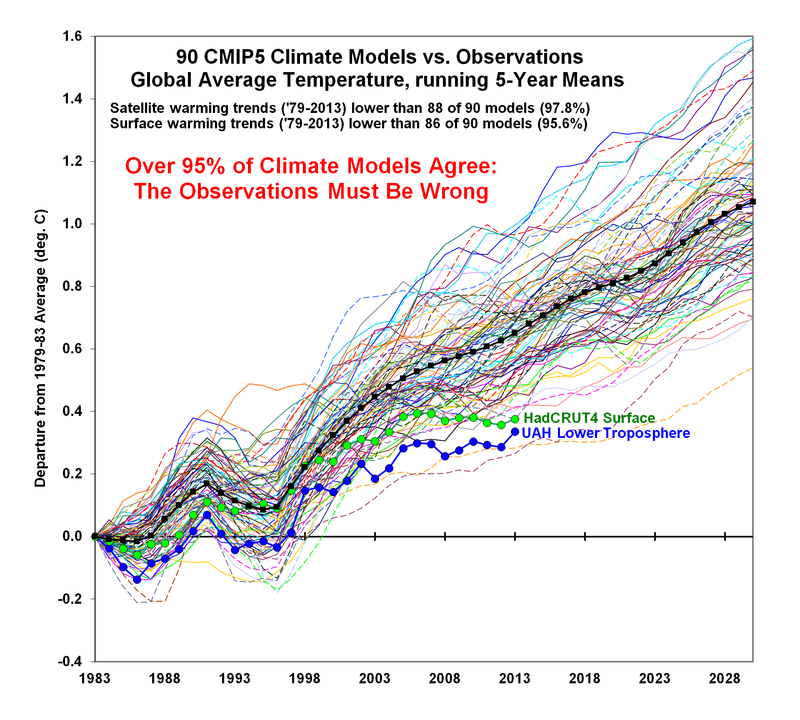 STOP EXPECTING CLIMATE MODELS TO MATCH ACTUAL OBSERVATIONS YOU IDIOTS! Clearly the gufuflesmirts, pdfs and johnson rods are not congruent with the michleson factor!!! Any MORON knows that! Apparently the lead editor is unable to parse that kind of high tech review himself so, well, um…. We will stay tuned in the coming days for the continuing saga as yet another climate scientist experiences public flogging for noting that modeled temperature trends are not consistent and way over observations. Willy: What the hell you need ball bearings for? Fletch: Awww, come on guys, it’s so simple. Maybe you need a refresher course. Fletch: Hey! It’s all ball bearings nowadays. Now you prepare that Fetzer valve with some 3-in-1 oil and some gauze pads. And I’m gonna need ’bout ten quarts of anti-freeze, preferably Prestone. No, no make that Quaker State. We see no indication, however, that transient climate response is systematically overestimated in the CMIP5 climate models as has been speculated, or that decadal variability across the ensemble of models is systematically underestimated, although at least some individual models probably fall short in this respect. A Gallup poll reported recently the percentage of people who believe in global warming and the impact on their lives. It’s interesting that the lowest point for the dark green line occurs in early 2010, right after climategate. People seem smart enough to recognize the basic physics of global warming, and some appear blindly susceptible to the fear mongering when it involves people hurting the environment. 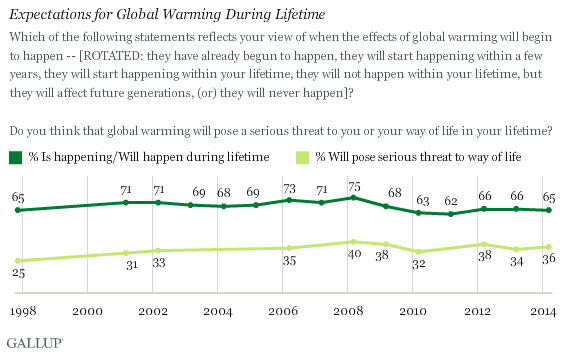 Considering that we have seen no global warming since 1998, it is impressive that 11% more people are afraid of serious effects to their lives than in 1998 when the first poll was recorded. They must think that the thermometer records are a an evil Koch brother plot or something. I don’t know, it is impossible to make any sense out of what people think sometimes. The good news is it only cost approximately a half trillion dollars to change those opinions. By that estimate, we can pass 50 percent fear-for-life for only another 637 billion and a supermajority of 66% for only 1.36 trillion dollars! What is it with “journalism” these days? Fabius Maximus wrote a post about the tea party which disparaged the Air Vent crowd. Apparently we are tribal and all you guys must belong to the tea party. He literally took the sentence: “I don’t think references add much credibility to correlation sorted paleoclimatology.” to “I don’t think references add much credibility”. And called it amazing that I disagreed with the need to cite. It looks like Fabius will be interviewing for MSNBC this week. This is the same individual who stopped by critiquing my copy-pasted reference to a chart I borrowed from WUWT, made several odd claims on a variety of subjects both politics and science, and several obscure claims about climate scientists — all without references. It’s somewhat similar to the incidence of fake quotes so often found on conservative’s websites. This is not often found in the work of climate scientists, who tend to be careful about selecting and citing sources. Anyway, I left a rough comment for him at his obviously superior “journalism” blog, perhaps he deserves a few friends. More interestingly, I had fun this weekend at the folks house. 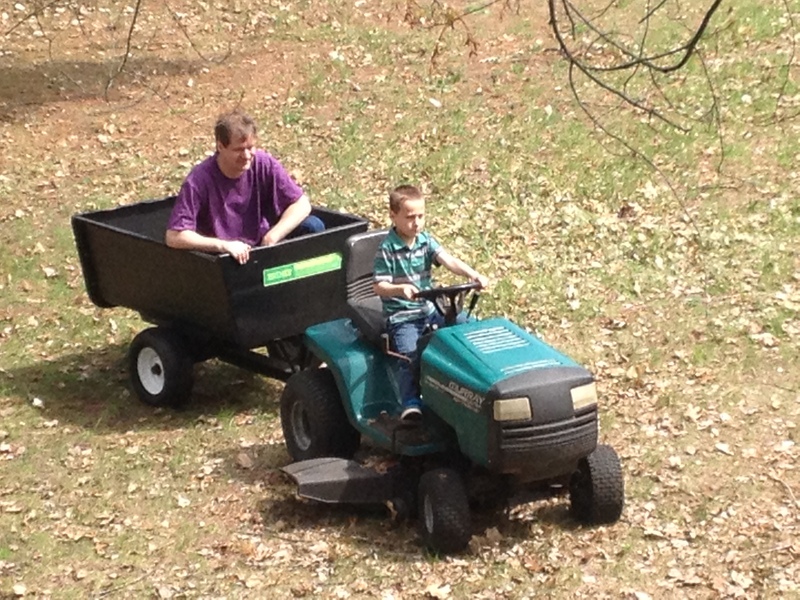 This is my son driving the lawn tractor (blades off of course) for the first time. We were returning from dumping about our 10th load of leaves. He was pretty serious about it! More seriously, these are known adjustments to the thermometers deemed necessary by climate science in order to accurately depict US temperatures. They are right from the US thermometer data, right from the USHCN website. The adjustments may be accurate and necessary and after the thermometers are corrected, they are held out by climate science as an excellent representation of actual temperature trends. Until the last few years, we had no true knowledge as to how accurate the corrected trends are. Before we go too far though, the corrections often seem quite reasonable, yet there is some conflict with satellite and radiosonde (balloon measurements). I’ve always been uncertain of their veracity. On other matters, we also know with certainty that climate models run too hot when compared to these adjusted observations. That said, some of the deeply ensconced climate alarmist types in the mainstream of the climate field have still failed to admit what is painfully obvious at this point, while other main stream types have moved off message to make corrections to the models. Basically my own really obvious “certainty” is still being argued with in ridiculous fashion in some die-hard corners of the climate science field. 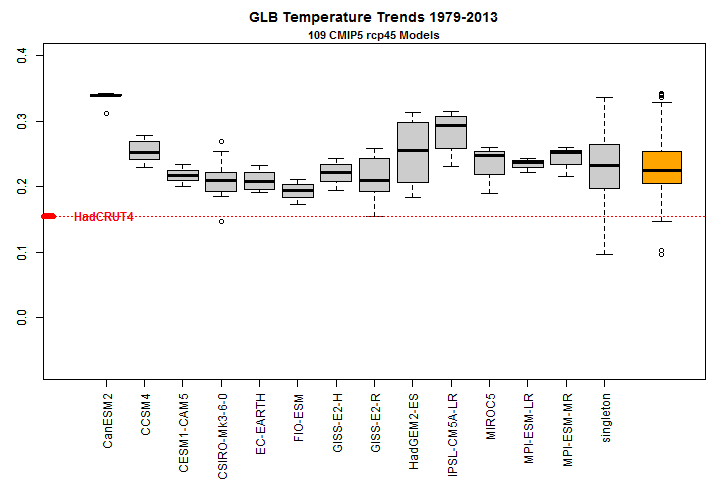 This graph above is from Dr. Roy Spencer’s blog and it shows the trends of ground temps vs modeled temps. In fairness, some of the more vocal climate scientists didn’t like this plot because of the start point Dr. Spencer chose, but the argument they made is complete nonsense as the SLOPE of the observations is the key and it is statistically much lower than the slope of the modeled data. Quite a few papers are published now stating this well-known fact in more statistically complete fashion, so this graph is not by any means a stand alone article to be critiqued out of existence by an inconvenient starting point. I often say that stats usually just tell you what you can already see in the data and normal people see models running ahead of observations. Why is that a big deal? Because it is extraordinary to find a statistically differentiable signal difference in a large group of temperature stations. Now I need to preface that statement with – stations that are not pre-selected for items which would knowingly bias their record. What Anthony Watts et. al. have done is rank temperature stations by pre-defined criteria, for the singular purpose of comparing data having different levels of human or environmental influence over their record. Anthony Watts biased the record by separating high and low quality stations! So lets consider for a moment what this says…. Stations with minimal influence (Class 1 & 2) show a much lower trend than stations with known influences. The difference is extreme — they show half of the trend of the temperature corrected result. That claim alone is frankly — huge. Nick Stokes, a known skeptic abuser and technically adept blogger, wrote what I found to be a very compelling post that showed historic temperatures for the entire globe can be estimated reliably by as few as 60 temperature stations. Although the post and math were very cool, the result isn’t technically that surprising. What it shows quite clearly though, is that no matter which 60 stations you choose, you end up with very similar results. Except apparently when Anthony Watts chooses the stations. From Nick’s entertaining demonstration, and from the mainstream climate science claims that homogenized corrected temperatures are accurate, it should be nearly impossible to choose less influenced stations by objective criteria and come to a significantly different trend than the homogenized result. But what Anthony Watts has demonstrated before and restated in a blog about coming work is that he has done exactly that. Data from the least influenced, and therefore the best possible thermometers, is dramatically lower than the homogenized land temperature trends that nearly everyone in climate science use in their publications. What is more, in Anthony’s previous work, he and his coauthors demonstrated a significant correlation between station quality and trend. The better the station sighting, the lower the trend. This is actually common sense in the weather industry as nearly every human influence to a local environment creates local warming effects. From adding blacktop, air conditioner outlets, blocking airflow with buildings, concrete runways on and on, progress almost always creates local increases in temperature which influences reading of individual thermometers. Other changes can shift temperatures cooler or warmer, such as station movement or changing the time of observation. None of the local warming/cooling effects are controversial from my reading, but all of these sorts of problems are what homogenization of temperature stations is supposed to correct for. Now Anthony’s previous work was roundly critiqued by people for certain shortcomings. Climate science is highly politicized so many of the critiques were unfounded and even truly wrongfooted attacks based on result rather than true scientific problems but Anthony took them seriously and has apparently come back with an improved version having again similar results which directly address previous issues. Instead of reducing the differences or limiting the difference between mainstream temperature publications and his result, the corrections have reinforced the previous results. Future critics of Anthony’s work can make the claim that he has made some error, or somehow his choice of station quality is biased in some unknown way, and they in fact have done those things in the past. However, these stations are classified by outside influence and it is extremely unlikely that an “error” would result in a continuous (or nearly continuous) reduction of trend from class 5 to class 1 stations. How could an error in the work produce such controlled results? It doesn’t seem to be a reasonable claim. To top it all off, Anthony’s result just seems like common sense. Stations not influenced by buildings or air conditioners, or movements, or time of observation, produce lower trends. To be clear again, I am not advocating for Anthony’s result, I haven’t read it. I don’t know it. 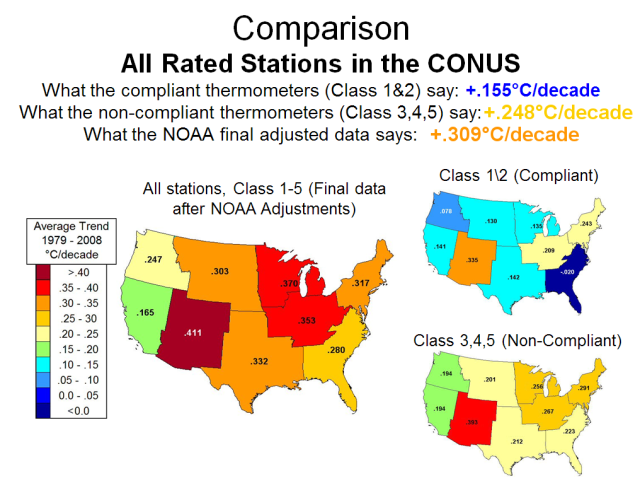 What I do know, and what I am saying is that there should be NO significant differences if the station quality was properly corrected for in mainstream ground temperature series. Either a gross error was made which is very unlikely as critiques have already been flown and addressed, or we have identified a big problem in land based temperature measurement. Thus far we have only a bit of commentary on the results from the BEST Berkeley data group, and it isn’t at all encouraging. I am hoping, and expecting, to see a group of more open minds look deeply into this in the future because Anthony Watt’s surface station project is the most thorough look anyone has ever taken at the quality of the temperature data being recorded. The results are dramatically different from our current understanding of temperature trends and that is what non-political science is about, understanding. If these truly revolutionary claims are correct, and scientifically in a multi-billion dollar field they are revolutionary claims, the global temperature trends (observations) are likely higher lower than shown in Figure 2 HadCRUT4 above and climate model projections are trending warmer than observations by even more than we already know. A proper, coldly scientific review is necessary and it will mean a full audit of global temperature stations if we ever hope to make truly predictive climate models. There is much more to write, I just hope that not just normal scientists, but mainstream global warming science takes a hard look at what this study is claiming in the near future. The good news for Anthony Watts is that if he is correct, ignoring the result will only delay the inevitable outcome as the cold science of temperature measurement will certainly prove stronger than a multi-billion dollar political movement.